A postcard depicting the organ from the chapel of Colleen Moore's (1899-1988) dollhouse, which was exhibited at the Gimbel Brothers in Philadelphia, Pennsylvania. It is made of ivory and gold, and was functional with electricity. Moore was a silent film actress who built the dollhouse with a former set designer in 1928. She contributed pieces to the house until her death in 1988. It is currently on display in the Museum of Science and Industry in Chicago, Illinois. Fields, Mary Durland. "50 Years Of Colleen Moore's Fairy Castle." The Chicago Tribune. August 23, 1985. http://articles.chicagotribune.com/1985-08-23/entertainment/8502250032_1_windsor-castle-dollhouse-science-and-industry. 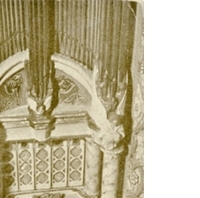 “Great Organ in the Chapel of Colleen Moore's Dollhouse Postcard.” RICHES of Central Florida accessed April 24, 2019, https://richesmi.cah.ucf.edu/omeka/items/show/6765.